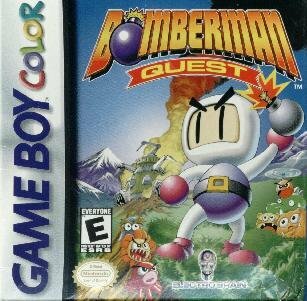 Having successfully captured several dozen evil monsters, Bomberman starts his journey to Planet Bomber to have them incarcerated. However, he is intercepted by four mysterious lights that sabotage the ship, stealing the engines and freeing the monsters! He makes a crash landing on a nearby planet, only to discover all the monsters are terrorising the populace. If he wants out of here, he's got to re-capture all those monsters, and find out who stole his ship's engines! 1998 was a year full of genre-shifting and oddball instalments, and although not as out-there as an kangaroo racer or a turn-based strategy game, Bomberman Quest certainly belongs with them. No longer a blocks-and-grids affair, the game takes place on a Zelda-like overworld and plays out like an action-adventure game. Bomberman solves puzzles and battles enemies to acquire new tools and items; these range from unique new bomb types to quirky tools, a variety of situation-specific armour and more. Some areas and enemies are impassable until you've got the right means to conquer them, and you may need to backtrack to make use of an item you didn't have before! Even the Battle Game is a change from the norm; players now have access to the weapons and equipment from their single-player game, allowing them to do battle with weird and wonderful loadouts. Trick foes with gimmick bombs, or harass them with shovels and hammers - the options are there! Bomberman Quest received a game guide book by Shogakukan.